Bouquet is a pleasing pattern with lots of pattern elements covering most of the pitcher’s surface. Fenton made the pattern around 1914. The design is composed of three panels with a half dozen or so daisy-like flowers and leaves. These panels are separated from the alternating panels by embroidery-type designs by a vertical cable band. This panel has three embroidered rosettes with a scale band background. The three mold lines are covered by these panels. Above these six panels is a wide cable band around the neck. Another band of the embroidered rosettes is above it. Around the top of this band is another thin cable. The top has a candy ribbon edge. The base of the pitcher is unpatterned. It has a collar base. The handle is applied. The pitcher stands 9 3/4 inches tall. Its top diameter is 5 11/16 inch, and the base is 4 1/4 inches. It is a bulbous type pitcher. The tumbler stands 4 1/8 inches tall. The top diameter is 3 inches, and the bottom is 2 7/16 inches across. It has a collar base and an unpatterned bottom. 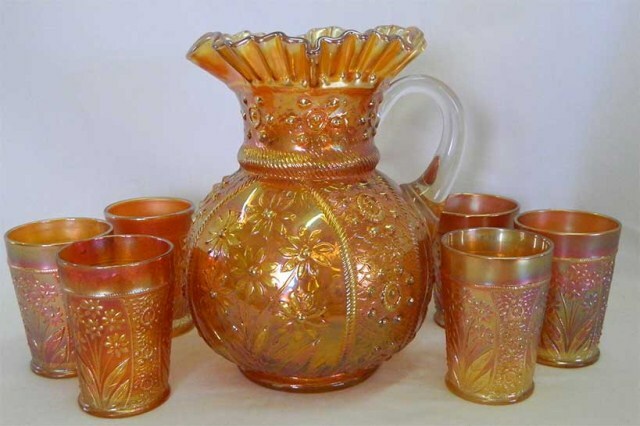 The three mold lines are covered by the same embroidery type design as that on the pitcher. This panel has three rosettes on a scale band background, also. The other three panels have a flower spray composed of six daisy-like blossoms on five stems with four leaves on either side. A cable separates each panel from the next one. A cable runs around it 5/8 inch from the top. The tumbler can be found in marigold, blue, and Persian blue. One source reports white, but John Britt said he had never located one. The pitcher comes only in marigold and blue. Ten marigold pitchers are recorded by the Mordini Price guides as selling from 19886-2002. The prices ranged from $140-$375. For the same time period he lists seven blue pitchers which sold from $145-$600. Ten complete marigold sets sold from $125 to $450. A six-piece set brought $245, and two five-piece sets sold for $240 and $245. Three complete blue sets ranged from $650 to $1,300. Three six-piece sets brought $425-$800, while two five-piece sets were $350 and $1,050. 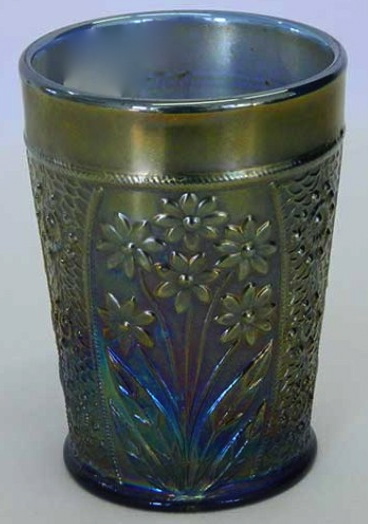 The Persian blue tumbler sold for $700. The marigold set pictured sold at the 2001 Great Lakes Glass Bash. Doty. A Field Guide to Carnival Glass. Edwards/Carwile. Encyclopedia of Carnival Glass, 7th edition. Heacock. Fenton-the First 25 Years. HOACGA. Pattern Notebook Educational Series-Tumblers. Mordini. Auction Price Guides 1986-2002.